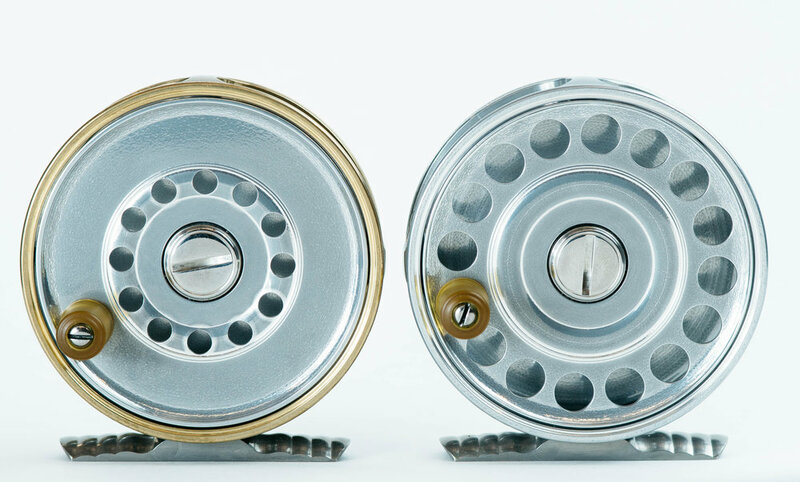 Fly Reels — C. Barclay Fly Rod Co. I have the distinct honor of being able to work with some of the finest craftsmen in the world. Even more so I get to call them friends. One friend, Masatoshi Okui of Kyoto Japan, who makes my seat hardware also makes the most wonderful classically styled fly reels I've ever handled. These reels are the perfect companions for the rods I build. I have wanted to offer my own reels for a while and couldn't think of anyone better than Masatoshi to make small batches of them for me. The 300 style is similar in style and size to the scarce Hardy Tealweight. These measure 2 11/16" across. The 'a' weighs 2.8 ounces/81 grams. The 'b' weighs 4.5 ounces/128 grams. The 301 style is similar in style and size to the venerable Hardy Featherweight. These measure 2 7/8" across. The 'a' weighs 3.2 ounces/90 grams. The 'b' weighs 5 ounces/145 grams. These reels have a subtle reversible right hand or left hand click. The click is not brash but smooth and pleasing. I plan to offer small batches of these reels as Mass is able to make them. The style and quantity will vary. I will keep this page up to date regarding stock and availability. The first batch has sold. More coming soon.